Recently my husband brought home some of the most beautiful roses I've every seen. It's hard to believe they actually came from the grocery store since they appear to be freshly cut from the garden. And the smell ... oh the smell, seriously amazing. I love the way these came out, soft and subtle. More of what I've been aiming towards in my still life images. Practice is an understatement. I want to thank everyone who left well wishes for my husband and daughter after their skiing accident. Elise was very sore for several days. The pain that started out in her neck radiated down into her back, but within a few days we were at the gym where she did some very low impact cardio. It's been just over a week and she is back at 100%, thank goodness. As for my husband, his shoulder and ribs were sore where my daughter slammed into him, but he healed up pretty quickly. My husband said he'd like to go skiing one more time this spring. Hmmmm .... I'm not so sure about that. Maybe if he leaves Elise at home. All I know is I'm loving the warmer weather we're having! Our snow cannot melt fast enough! Are you looking forward to the time change? I know I should be but getting up in the dark again is such a drag. When I shot the photos above Luna expressed a lot of interest in what I was up to so I thought you might like a little look into what was going on behind the scenes . . .
She'll eat almost anything. Luckily she looks cute because at one point she had a piece of petal in her mouth! Sorry, no picture of that. One thing you want to be careful of is those fangs. They're long and sharp. And she's not afraid to use them. Trust me. 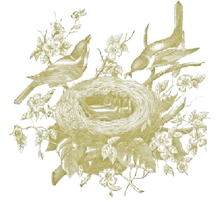 I hope you enjoy a wonderful warm Thursday where ever you are! Here in NH we're headed for the 60's!!! Yippee!!! Glad your family is healing up. 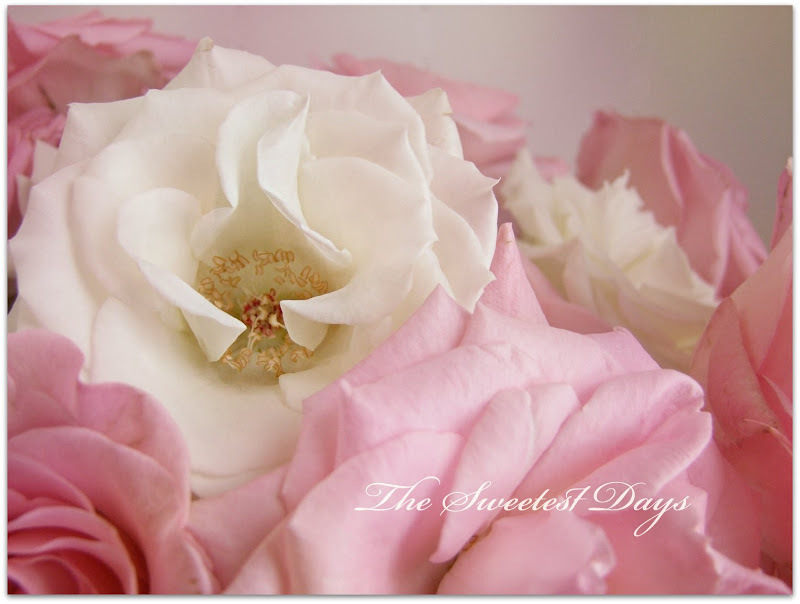 Those rose images are incredible and beautifully soft. 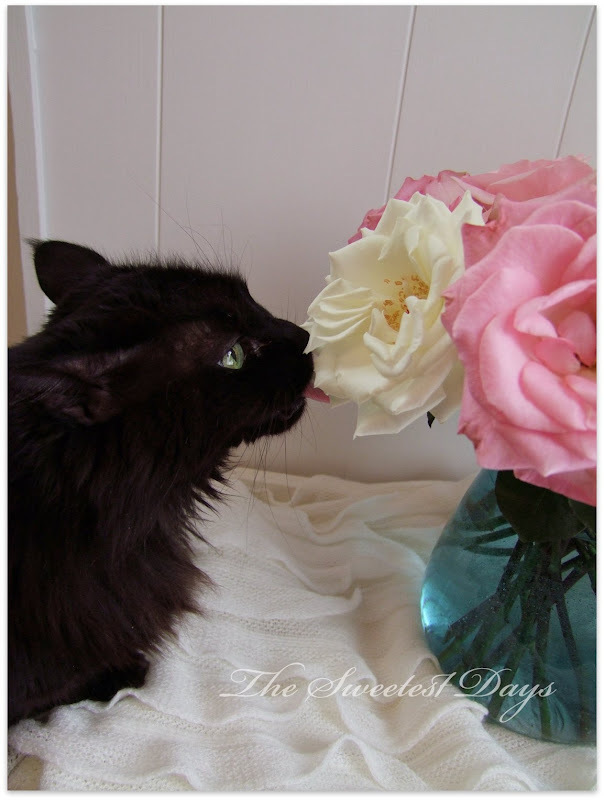 Miss Luna Balloona - She is a beauty - just like the roses! I am so glad everyone is on the mend! 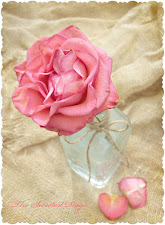 And those rose photos are gorgeous! Enjoy the weather - 60 in ny today too. Oh Sharon I hadn't read about the accident until now. You must have been so nervous. I'm glad they're both doing better. Love the photos. What do they say never work with children or .pets...haha. They just do what they want but I suppose that's what makes them fun to watch. Hi Sharon...good to hear all is well at your house! That kitty cat is so cute! The second photo is just blowing me away! It is so gorgeous. You do take the most beautiful pictures I have ever seen. Really. 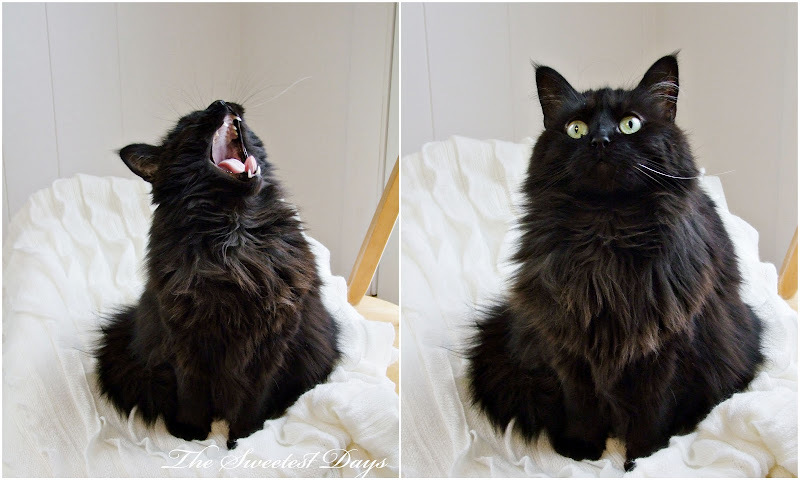 Stunning and gorgeous shots of the flowers...and the cat yawning??? PRICELESS!!! Those roses do look like they came from a country garden. Your black beauty is stunning. As I am so far behind this is the first I have read of the skiing accident...and I am thrilled that it has ended so happily. Seems like just yesterday I was just talking to friends about skiing accidents and how smart it is to wear helmets. When my kids were young no one wore them and it is pure luck that no one had any injuries! Hi Sharon, just found your blog and have been reading some of your posts. Your photography is beautiful! It's quite a coincidence that I am going through the same thing with my son that you did with your daughter. He works at Cranmore and the chair lift bumped him in the head last weekend. He said he was fine, but has been developing symptoms of some head trauma and we are off to the doctor's in a few minutes. I thought he would be safer working than skiing, but I was wrong! They don't wear helmets when they are working the lifts! One word and its Gorgeous. I hope all is well with your sun, Syndi. That kind of stuff is really scary! GORGEOUS! I love roses. These ones are stunning! I love how soft they look through your photography. Your cat is adorable! 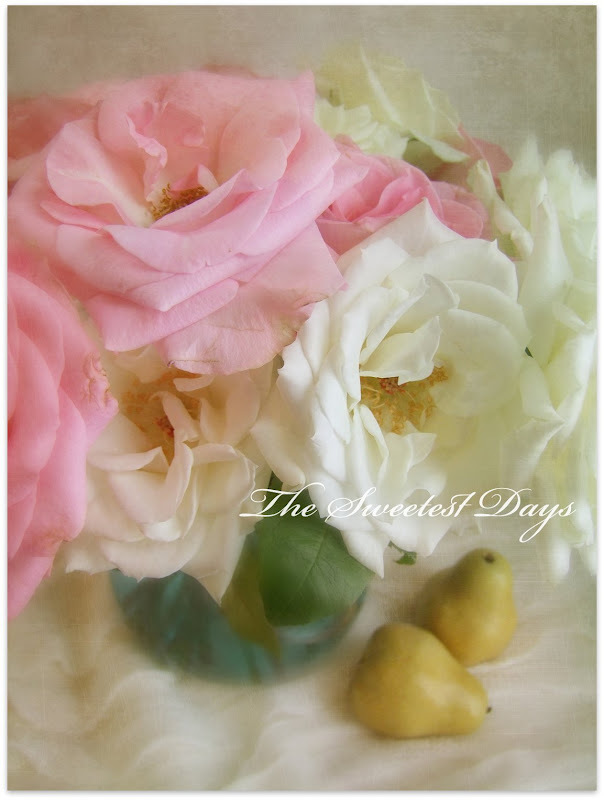 Beautiful photos, Sharon...love the roses and the pears together! That silly Luna, eating the petals...but she is such a beauty! Glad to hear your husband and daughter are feeling better! I was loving that warmer weather...I want it back!! 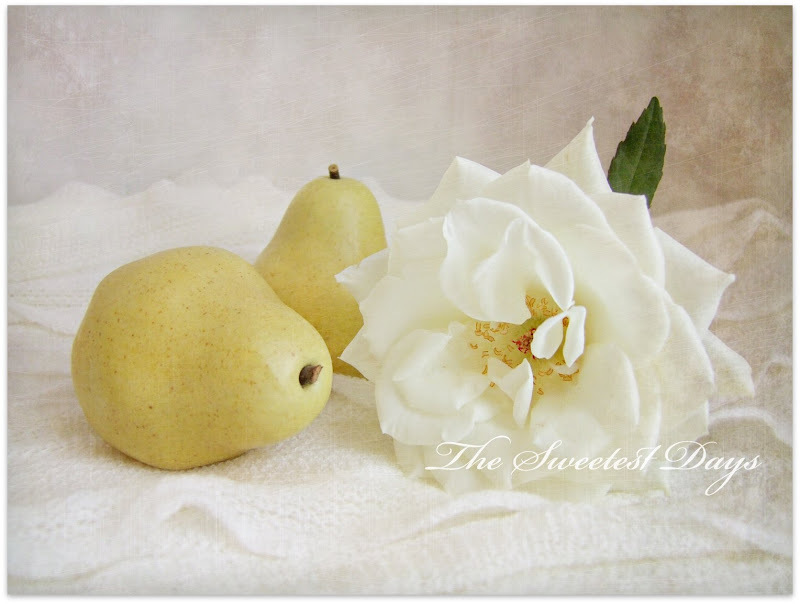 Beautiful photos, Sharon...I love the roses and pears together! That silly Luna, eating rose petals...she is such a beauty though! Glad to hear your husband and daughter are feeling better. Wasn't that stretch of warm weather wonderful...I want it back!! !